Rebecca (Becky) James is available to book as motivational speaker for your special event – we work in direct association with Becky’s representative as a booking agent for Rebecca James. Rebecca James began cycling aged 11 at an afternoon cycling club at her school, and was accepted onto British Cycling’s Olympic Development programme in 2007 when she was 15. Following 4 Junior National titles and 2 European Championship titles, Rebecca James went on to win another 2 Gold medals at the 2009 Junior Track Cycling World Championships. Rebecca’s progress continued as she moved from Junior to Senior competition, winning 2 Commonwealth Games medals for Wales in 2010. 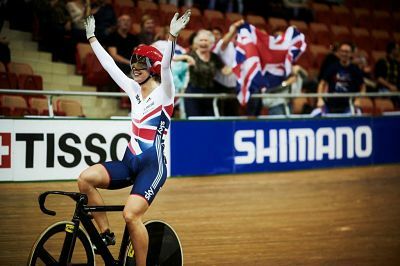 2013 has been Rebecca James’s most successful season to date, winning 2 World Championship Gold medals and 2 Bronze medals, making her the first British rider to win 4 medals at a single World Championships. In October 2013, Rebecca James opted to take part in the prestigious Japanese Keirin circuit and proved her world class ability by winning each of her 9 races. Despite a period of illness and injury requiring lengthy rehab, Rebecca James won 2 World Championship Bronze medals in 2014 and Bronze in the Keirin at the 2016 World Championships in London. Five months later in Rio where Rebecca James made her Olympic Games debut for Team GB, she won two Silver medals in the Keirin and the Sprint, setting a new Olympic Record of 10.721s in qualifying for the Sprint. With a variety incredible achievements in the world of cycling Rebecca James chose to retire in August of 2017 with plans to start a bakery. She has since set up two businesses; her very own cake company called ‘Baked By Becks’ where she has made numerous cakes for weddings and other occasions, as well as a coffee van company alongside her fiancee George North. Rebecca James also bestows her cycling wisdom by coaching two cyclists, one of which is her sister Rachel. Contraband is the UK’s top booking agent, with affable, experienced account managers who guarantee you the best deal possible. Contact us today if you would like to book Rebecca James to be the headline of your event! We as your booking agent are more than happy to help you create the most memorable moments with Rebecca James.